Well, it has been one whole year since I have written a blog post..ah! Mad Radish experienced some pretty big changes during its inaugural growing season of 2016. We now call Four Winds Farm in Peterborough our home. We are working with the Holmes family who raise grass-fed milk, beef and lamb, along with pastured pork and eggs. Due to this new partnership, along with both labor and financial constraints of our small-scale livestock enterprises, we have decided to largely phase out the animal presence at Mad Radish. In 2017, we will be growing more vegetables for more markets in Peterborough and the greater Monadnock region. We are also newly Certified Naturally Grown, which we hope will be a way we can better communicate our growing practices to our CSA members and market customers. What is a farm without animals though, right?! That's how we feel. We aren't getting rid of critters all together! So the second part of our vision for Mad Radish includes a micro goat dairy. 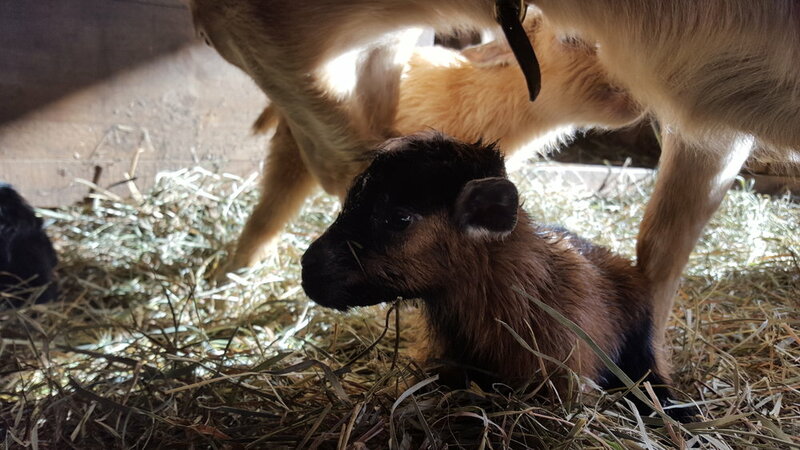 We plan to expand our goat herd to produce grass-fed milk and (eventually) yogurt and cheese. We will also continue to have our grass-fed beef and lamb for sale in 2017, but are phasing out both operations for the immediate future. We have exciting new CSA share options this year, including both a Market-Style share and a Farm Store share at Four Winds. Details can be found on the CSA page of this site. If you prefer the traditional CSA share option, we offer both an on-farm pick up twice weekly, and deliveries to Keene and Peterborough farmers' markets. And, finally, the most exciting news of all....we will be having our Second Annual Mad Radish Open House on Sunday, May 14th, at 3pm! Take a short farm tour, hang out with the goats, and grab a bite to eat with us. Bring a side dish or drink to share, and we will cook up some farm foods too. There will be a few surprise raffles -- last year we raffled off a CSA share! -- so don't miss it!! Michael and Meg try out a new seeder for lettuce mix. Garlic might be the best picture of Spring. New goat babies at the farm.